Did Your Slave Master Ancestor Go to Missouri? 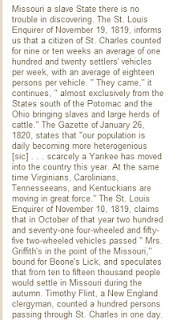 I was recently asked "where did the slave masters come from in order to settle in Missouri?" The answer is many of the Missouri slave owners came from Kentucky, Virginia, Tennessee and the Carolinas. The largest slave holding counties were around Saline County: Boone, Manitou, Howard, Chariton, Cooper, Clay, Ray, and Lafayette counties. These counties are within 90 miles of one another and nicknamed Little Dixie. Researchers will quickly learn that if you find an ancestor in one, it will behoove you to expand your research to include the other counties. Why did Plantation Owners Move to Missouri? The Missouri land was ready for cultivation of familiar crops - hemp and tobacco. Even the transplant planters familiar with cotton growing knew that growing hemp and tobacco was similar and required an easy transition with the work of slaves. Eighteen percent (18%) of Missouri’s hemp crop was cultivated in Saline County (before 1861). Even if you have a Mississippi ancestor, finding ties to Saline County Missouri may be found in agricultural records. Did you know that Missouri shipments, mostly from Claiborne Fox Jackson’s company in Saline County, shipped commodities - hemp, corn, oats, salt, pork, beef – to Natchez Mississippi to feed the cotton field slaves? Did you know your slave master ancestor is named in every court record and many vital records of his slaves before the Civil War, and many after emancipation? Descendants of slaves know, too well, that researching their ancestors involve thorough slave master research. However, the same applies when researching slave masters. The sale of a slave of his family is noted in the deeds of the slave masters. Ship manifests transporting slaves often name the slave-master. After the civil-war, ex-slave documents, including ex-slave Civil War pension records, legalization of slave marriages and other freedman bureau records, usually names the ex-slave master and his place of origin. We can often determine slave master whereabouts after the Civil War using these records. Ex-slave masters were directly tied to ex-slaves and their identities for years following the Civil War. Dr. Bill, I love Missouri history and I know you do. Working with the records I'm amazed at the depth of information I'm finding. I'm struck by your final comment: "Ex-slave masters were directly tied to ex-slaves and their identities for years following the Civil War." I've got to get busy with the court records of the ex-slave masters among my ancestors . . . as soon as I get straight the lines of these ancestors, and who "willed" which slaves to whom... then I can do the deeds for sales of "property" (such an outrageous time in history, geez!). 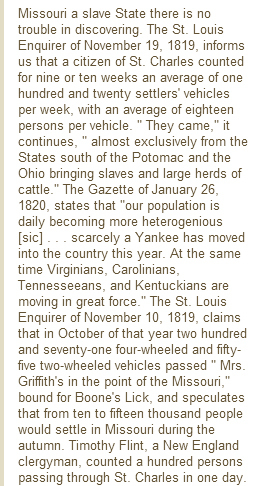 And thanks, I never considered that slave owners moved from the Carolinas to Missouri. Good point! Some of my surname moved to Alabama and Texas and Georgia in the early 1800s, it seems. I'll never track them all down. But hey, that's OK. Thus my mantra of "its American history". If we fail to broaden our search we fail to tell the whole story. Our ancestor's story includes the entire community.